The Fellowship was fortunate enough to obtain a copy of HAUNTED HORROR #1 from IDW Publishing. The storywriters are unknown, with art by Jack Kirby, Joe Simon, Jack Cole, C.A. Winter, Bernard Baily, Jay Disbrow, Mike Sekowsky, and Bill Walton. 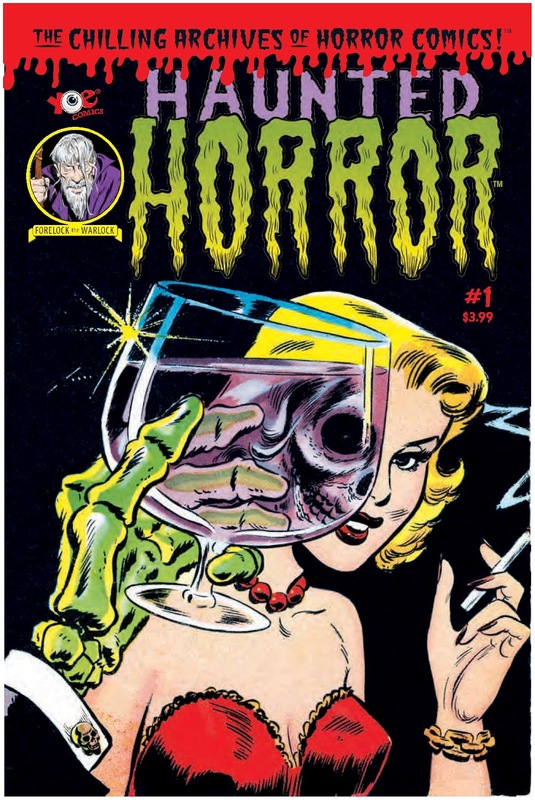 This is the first in a series reproducing tales from classic horror comics (including WEB OF EVIL, BLACK MAGIC, and THIS MAGAZINE IS HAUNTED) from the early 1950s. Tales involve: beautiful mysterious ladies out on a deserted road, dead business partner checking up on his surviving partner, the original black widow, alien invaders, and a couple of evil curses. These classic horror tales were very entertaining. I didn’t get into these types of books as a kid, so it’s nice to go back and read what I miss (even though these are well before my time). Even though these stories are almost sixty years old, they are just as good and scary as today’s horror comics. You also have some legendary artists (Cole, Disbrow, Kirby) applying their talents in these tales. If you want to get into the Halloween mood, or looking for some classic horror of yesteryear, pick up this issue. HAUNTED HORROR #1 is in stores now and available at www.idwpublishing.com.